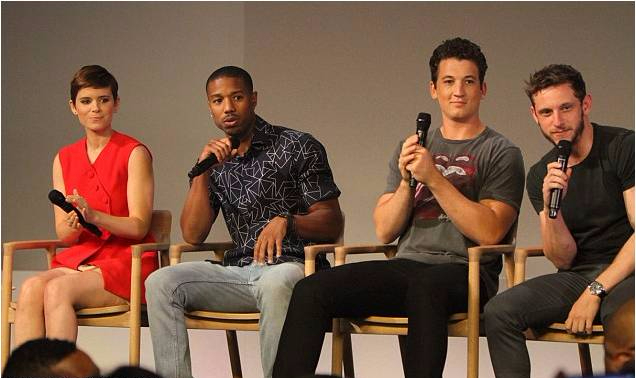 Miles Teller was photographed wearing Bravado x Lucky Brand yesterday during a press event in New York! The Fantastic 4 star kept it casual wearing his The Rolling Stones Tee (www.luckybrand.com). Fantastic Four (stylized as Fant4stic) is an American superhero film based on the Marvel Comics superhero team of the same name. It is the third theatrical Fantastic Four film to be distributed by 20th Century Fox, and a reboot of the Fantastic Four film franchise. Directed by Josh Trank, with a screenplay by Jeremy Slater, Simon Kinberg and Trank, the film stars Miles Teller, Michael B. Jordan, Kate Mara, Jamie Bell, Toby Kebbell, Reg E. Cathey, and Tim Blake Nelson. In Fantastic Four, the team must learn to harness abilities gained from an alternate universe to save Earth from a former friend turned enemy. You may also be interested in viewing Miles Teller in an Eagles T-shirt.